Unfortunately, SeaWorld's business model is built on an antiquated form of animal entertainment which is dwindling in popularity and is no longer seen as humane by many people. It is also a form of entertainment that puts SeaWorld trainers at risk, and has caused the deaths of four people, including SeaWorld trainer Dawn Brancheau. It is ironic that SeaWorld launched its latest assault on "Blackfish," a film that has brought the question of marine mammal welfare to the center of public debate, at a time when approximately 250 bottlenose dolphins were trapped, killed or sold to aquariums in Taiji, Japan, the town featured in the Oscar-winning documentary "The Cove." While the global community is outraged and condemns this horrific dolphin hunt, SeaWorld has watched from the sidelines. Had SeaWorld added its powerful voice to the efforts to stop this drive hunt of dolphins for use by the captive industry -- perhaps many dolphins would have been spared. SeaWorld can call "Blackfish" propaganda. This does not make this assertion true. We stand by the film and the truths it tells. We also stand by the brave whistleblowers featured in it. SeaWorld's disparaging comments about those associated with "Blackfish," its efforts to dissect arguments and make specious claims about film sequences, are an attempt to deflect from the real issues the informed public cares about. For the record, we believe our audience is intelligent and in control of their own emotions. We urge them to conduct additional research on topics such as SeaWorld's separation of mothers and calves, the increased mortality rate of orcas in captivity, the impact of captivity on orca health, and the frequency of killer whales injuring one another and trainers. They will reach the same conclusion we did. It has other people capture animals for them. It is important to note that SeaWorld does not have to directly capture whales from the wild in order to "obtain" whales from the wild. They are involved with captures of cetaceans orchestrated by other facilities and other countries. In fact, SeaWorld is currently part of a consortium trying to import wild-caught beluga whales from Russia. 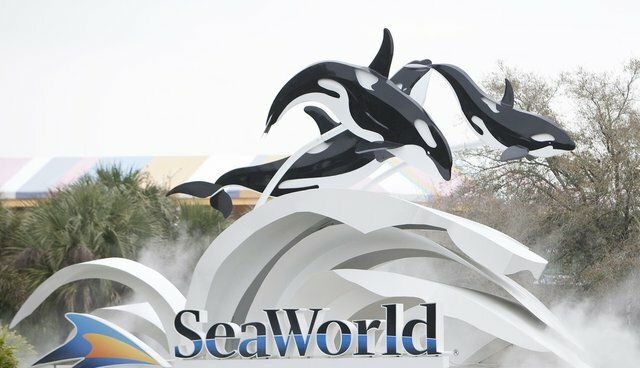 Due to the "genetic bottleneck" that years of inbreeding has created, SeaWorld will have to continue considering different ways to obtain animals from the wild. "Rescues" are often veiled attempts to secure wild animals. A whale called Morgan, rescued in the Netherlands in 2010, was not released as local law required but was instead transported to a park in Spain. When SeaWorld published documents listing its "assets," Morgan appeared as a part of its "collection." She is now being bred and performs tricks alongside other SeaWorld whales in Spain. Despite orcas having life-long family ties, SeaWorld airlifts animals from park to park to accommodate the demands of its business. This is standard procedure for other animals in its collection as well. The primary reasons for separating offspring from mothers are breeding and entertainment priorities. Using artificial insemination techniques it pioneered, SeaWorld routinely breeds female orcas at much younger ages and shorter intervals than in the wild. Some refer to this as "babies having babies." When a mother is ready to breed again, SeaWorld may ship an existing calf to another park. If a mother's ability to perform in shows is being compromised by the demands of a calf, SeaWorld's solution is to move the calf. And, as the industry recognizes, a financially struggling park benefits greatly from displaying a "baby Shamu." Separations are always a grueling process and there are many more incidents of this trauma than were depicted in "Blackfish." For example, during the course of our investigation we learned the story of a killer whale mother named Kalina who became distraught when her daughter Skyla was shipped to another park. Kalina "broke open her face," suffering lacerations from banging into the gate separating her from her baby, who was only two years of age at the time. At the same moment, Skyla was being harnessed and craned out of the pool. According to our sources, Kalina and other whales can stop eating and "shut down" due to the trauma of these unnatural separations, and may even be put on diazepam (valium) in an attempt to ease the stress. "Blackfish's" point is not just that separation of mothers and calves is a welfare issue for captive killer whales (though it is the most acute issue), but that ANY separation of mothers and offspring, can cause trauma or emotional distress for killer whales. It is beyond debate that mother-offspring separations are an intrinsic element of SeaWorld's business model. 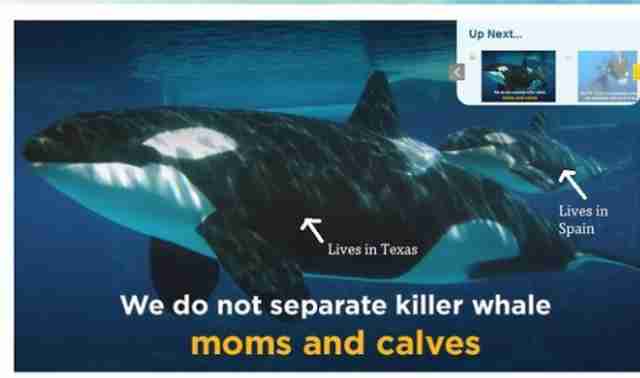 SeaWorld does not maintain family units. SeaWorld continues to brand scientists, researchers, advocates, former trainers and even filmmakers who independently report less than flattering information about its parks as radical activists. SeaWorld's personal attacks towards those associated with "Blackfish" and other films, books and scientific papers are an age-old tactic to deflect from real issues such as evolving societal norms and animal welfare. For "Blackfish," we relied on input from diverse individuals and we cover a 40-year span of time. Whether these individuals captured killer whales for SeaWorld decades ago, researched them in the wild or trained killer whales at SeaWorld as recently as two years ago, they have independently come to a conclusion that is not favorable to SeaWorld. Maligning them on this basis does not make for responsible criticism. Rather than shooting the messenger, we invite SeaWorld to be partners in an open discussion about a new business model, one that evolves away from animals for entertainment toward more dignified and sustainable models. As part of SeaWorld's recent marketing effort to combat negative publicity from "Blackfish," the company has released a series of highly stylized, professionally produced videos. This is the kind of slick branding we have seen from SeaWorld for years. The problem with this PR spin is it often uses misleading statements, even when the subject is as serious as human deaths. In addition to the loss of many animal lives, tragically four people have been killed by captive orcas. SeaWorld continues to maintain that no one determined whether SeaWorld's bull whale Tilikum pulled Keltie Byrne into the water at SeaLand of the Pacific, an act that led to her death. SeaWorld purchased Tilikum after this incident, but admitted in court that it never conducted its own investigation. As filmmakers, we investigated the Byrne case further and found two eyewitnesses -- never contacted by authorities at the time -- who verified that Tilikum did in fact pull Keltie in. As expert witness Dr. David Duffus attests in his full length interview with the filmmakers, "He was the main player unquestionably. He had her in his mouth the whole time." In what appears to be a sustained effort to mislead the public about these deaths at its parks, SeaWorld continues to claim that park guest Daniel Dukes died of hypothermia although it is immediately clear from his autopsy report that this is false. Duke's had numerous pre-mortem injuries consistent with Tilikum dragging him around the tank. Despite this forensic evidence, SeaWorld maintains that without witnesses it is impossible to determine if Tilikum was actively involved in Dukes' death. In another example, SeaWorld has "loaned" several valuable orcas to Loro Parque, a marine park in Spain. SeaWorld trained all of Loro Parque's trainers, and a SeaWorld trainer was supervising the session in which Spanish trainer Alexis Martinez was killed. SeaWorld then outrageously claimed it had no association with Loro Parque and even tried to distance itself from this partner facility in a court of law. Finally, those who have spoken on behalf of SeaWorld have repeatedly blamed Dawn Brancheau for her own death. Thad Lacinak, former VP of Animal Training at SeaWorld and a frequent media spokesperson in the days following the incident in February 2010, claimed it was Dawn's "mistake" that led to her death, SeaWorld's own expert witness in the OSHA case, Jeff Andrews, claimed "the only thing that led to this event was a mistake made by Ms. Brancheau." Jeff Andrews is now the Vice President of Zoological Operations at Busch Gardens Tampa. The Orange County Sherriff's office reported that Dawn slipped and fell based on information provided by SeaWorld employees. However, the nature of Tilikum's attack on Dawn Brancheau was prolonged and violent, during which he removed her arm, scalped her and caused blunt force trauma to her entire body. It was not "curiosity" or "play" as described by SeaWorld. An Apt Metaphor -- SeaWorld is still not addressing the elephant in the room. Is captivity suitable for orcas? In confinement, orcas are often prescribed daily medications to treat chronic symptoms brought on by captivity. Every year, they die at almost three times the rate they die in the wild, leading to shorter life spans, and are airlifted around the world as commodities. They have damaged teeth, collapsed dorsal fins, they show frustration, grief, and exhibit unnatural aggression toward one another and toward people. More orcas have died under SeaWorld's care than are currently in its collection today.